Gjuk is a Nord warrior. Along with Alding and Irlof, he forms the crew of Blood Horker Captain Stig Salt-Plank. He and the rest of the crew only exist during Rise in the East, after you give the logbook to Orthus Endario, where they are found in the Windpeak Inn, partaking in their regular "festivities". 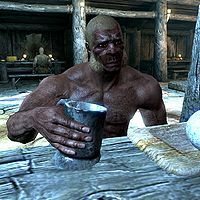 During the whole duration of the quest he can be found sitting in place at a bench inside of the inn, enjoying a tankard of mead or eating bread. He wears nothing but a pair of ragged trousers.